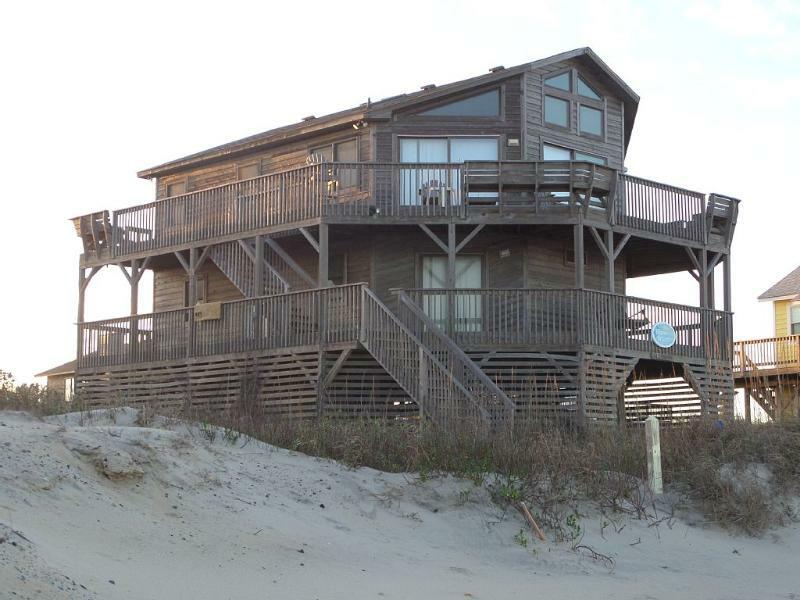 Nags Head house: Large Oceanfront Home! 3 Master Bedrooms! Large Oceanfront Home! 3 Master Bedrooms! Now booking for the 2019 season! Large Oceanfront Home! 3 King Master Bedrooms! Get Your Dose of Vitamin Sea at Ye Scurvy Sea Dog! This BEAUTIFUL Traditional Nags Head style home is oceanfront, with uninterrupted views of the beach and ocean with an affordable price tag. Ye Scurvy Sea Dog is sure to give your family an amazing dose of Vitamin Sea! Ye Scurvy Sea Dog is located in a quiet area of the Outer Banks, yet is still close to great local restaurants, shopping, and family attractions. This comfy beachy cottage is the perfect beach getaway and has everything you need for a great family vacation. You and your family will enjoy the large, uncrowded, and family oriented beach. Our spacious floor plan includes a living room, a bright and sunny kitchen and dining area with plenty of seating for the entire family. Relax with your morning cup of coffee on the sun deck with your ocean view - enjoying the cool breeze and relaxing ocean sounds. Spend your days sunbathing or splashing around with the kids at the beach. Come back and let your stress drift away under the stars while listening to the ocean sounds. Enjoy cooking your meals out on our charcoal grill or preparing them in the well stocked kitchen...and if you don't feel like cooking you're just a few minutes away from the best restaurants the OBX has to offer! If your family has been looking to turn their vacation into wonderful memories, look no further because you've reached your paradise at Ye Scurvy Sea Dog! We hope you will make Ye Scurvy Sea Dog the vacation house you return to year after year. Ye Scurvy Sea Dog is located on a quaint and quiet street at MP 20.5, close to many fishing piers and Oregon Inlet. Bottom Level of Cottage: Second master bedroom with King bed, flat screen TV/Cable, sliding glass door opens to deck and ocean. Third master bedroom with King bed, flat screen TV/Cable, sliding glass door opens to deck and ocean. Bedroom four with two Pyramid bunks. Bedroom five with two twin bunk sets. Laundry room with washer and dryer. Top Level: Main King master bedroom with flat screen TV/Cable, in suite bathroom. Living room with flat screen TV/Cable and DVD player. Fully stocked large kitchen and dining area. Sliding glass doors open to top deck to ocean and beach. Ask about our discount for check/e-checks! During Summer Season Turnover Day: Saturday (mid May to end of September). Off season turnover can be arranged for any day. 3 Night minimum stay during non peak summer season. 2 night stays can be arranged with the addition of a $150 cleaning fee. Nearest Airport 80 Miles Nearest Beach Oceanfront Home - Nags Head! We had a wonderful trip to the beach! A nice clean house with beautiful views and right on the beach - exactly what we were looking for. The owners were very helpful and flexible on this last-minute reservation. We would definitely go back. Owner's reply: So glad you enjoyed your time. We love the home and the views from the home. This house is amazing! It is clean and well-organized. The views from the living room are breathtaking! The house is so spacious and such a great location. The bed was very comfortable. The kitchen is well stocked. It was very easy to book the house, too. The seating areas on the outside decks are great and add to the enjoyment. Looking forward to staying here again!